R.W. Sir Robert Baird. 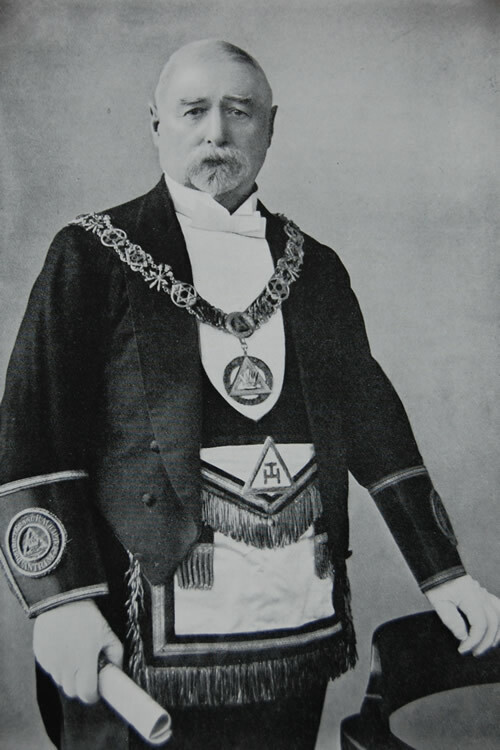 31o, K.B.E., D.L., PPSGW Antrim, Grand Treasurer of GL of Ireland. R.W. Sir Robert Baird, 31o, K.B.E., D.L., J.P., was initiated in Lodge 109, and had a long and distinguished Masonic career. In the midst of a busy business life he was always able to find time to devote to the interests of the Craft, and won for himself a high place in the affections of the brethren. In him the Masonic Charities had a generous and sympathetic friend, and the masonic Female Orphan School was fortunate in having him as local Treasurer in Belfast. The Grand Lodge of Ireland, recognising his worth, honoured him with the position of Grand Treasurer, as well as by electing him its Representative to the Grand Lodge of Virginia, USA. On the resignation of V.E. Companion Wm. Redfern Kelly, 33o, Sir Robert Baird was chosen to succeed him as First Principal of the District Grand Royal Arch Chapter of Antrim, a position he held with the full approval of his Companions until, much to the regret of the whole Fraternity, health reasons necessitated his resignation. The respect in which he was held by the London Freemasons was expressed in 1924, when they elected him W.M. of the “Motherland” Lodge, and the members of the “Ulster” Lodge, London, always had a warm welcome for him when he visited them. In business life he was Managing Director of the “Belfast Telegraph”, the largest and most influential newspaper in Ireland and he took a warm and enthusiastic interest in the general welfare of the city. For his services during the war, His Majesty the King conferred upon him the high distinction of Knight of the British Empire, greatly to the gratification of his friends and brethren, who all united in hoping he may long be spared to enjoy the honour, and to continue his activities as a valued and respected citizen of Belfast, as well as a distinguished member of the Masonic Fraternity.